For the 6th year, the BTC Campus strengthens knowledge and self-esteem of young people • BTC d.d. This year, the BTC Campus – a programme of additional entrepreneurial education for better employment possibilities of young people – has opened its doors for the 6th time. In 2018, they offer a refreshed programme that gives young people insight into modern technologies and modern entrepreneurial approaches. The cooperation of the BTC Company, the Employment Service of the Republic of Slovenia, Center of Business Excellence of the Faculty of Economics of the University of Ljubljana, and the City Municipality of Murska Sobota will enable 60 young people to soak up new entrepreneurial knowledge on two locations. 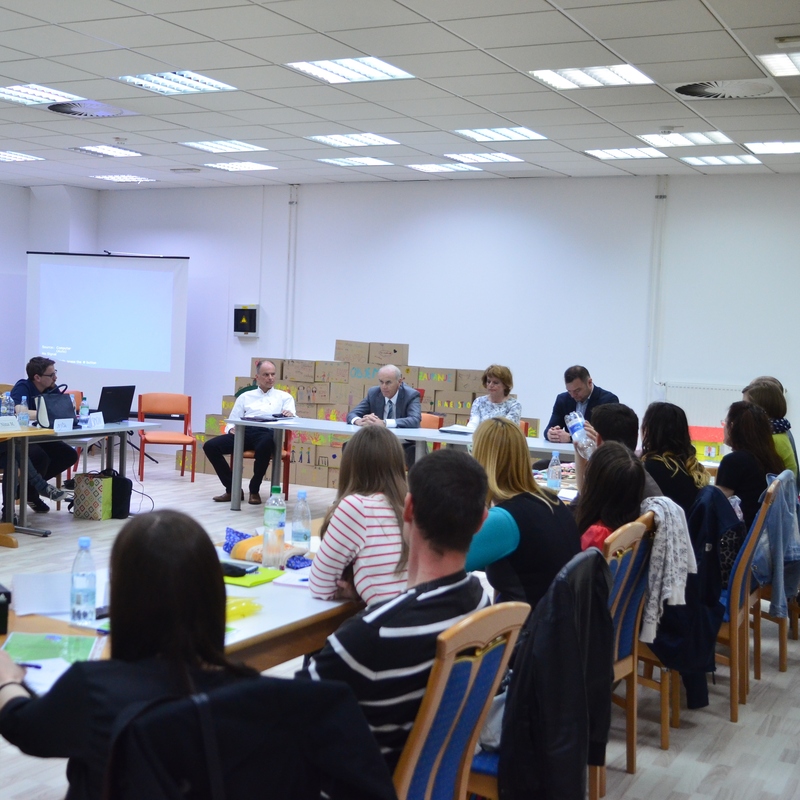 This year’s first meeting of young people takes place today, 23rd March 2018, in BTC City Murska Sobota – a location that has hosted the event for the past three years – while the 6th generation of BTC Campus participants in Ljubljana will start its programme in ABC Hub in BTC City Ljubljana. Searching for employment is not easy. After concluding their studies, young people are confronted with the hardships of entering the employment market and facing the challenges of the Slovenian economic environment. In the process of successfully seeking for employment, any type of additional knowledge, ability or acquaintances represents added value. In order to help young people gain employment, in 2013, the BTC Company and its partners established the educational programme BTC Campus. This unique educational programme allows young people to strengthen their entrepreneurial skills by discussing and dealing with real business challenges, good practices, and cooperation with other participants. This year, for the first time, they will have insight into the world of modern technologies and modern entrepreneurial approaches. For the 6th consecutive year, 30 young people in Ljubljana are given the chance to participate in the BTC Campus programme, and for the 3rd consecutive year 30 young people in Murska Sobota are able to take part in it, as well. The BTC Campus is intended for all young people who are seeking employment and are registered as unemployed with the Employment Service of the Republic of Slovenia, which on the basis of the demonstrated interest of unemployed graduates in additional education, networking, and the search for employment prepares a selection of participants. In Ljubljana, the BTC Campus will take place from March to May in ABC Hub in BTC City Ljubljana. Lectures will be held by lecturers from the Center of Business Excellence of the Faculty of Economics of the University of Ljubljana: Rok Stritar, PhD, Blaž Zupan, PhD, and Marjan Kramar. This year, for the first time, a 3-day hackathon will take place in the scope of the BTC Campus. Although the unemployment rate among young people in Slovenia has decreased, the numbers of those seeking employment are still high. Therefore, the inclusion of young people into the workforce market is necessary. Part of the prospective of educating young people for a successful development of Slovenia is also the BTC Campus. This programme of unique cooperation between academia and economy has in its five years of implementation equipped as much as 211 participants with entrepreneurial skills. After taking part in the programme, 72 per cent of programme participants have found employment or have started their own business. Attesting to the programme’s success is also the award PRYJATELJ LETA, awarded to the BTC Company as per people’s choice by the Institute Ypsilon. Last year, the BTC Company’s programme also received recognition by the Employment Service of the Republic of Slovenia for strategic partnership and help in the implementation of strategic aims of the institute and indirectly for decreasing the unemployment rate in Slovenia. It is exactly these skilled and educated young people – on whom the BTC Company has focused – that will bring Slovenia on the path of successful long-term development.